I am still in Canada, and it looks like I shall be here a bit longer. Enjoying it, but I am missing the Barbadian food again. So, even though I am not back home with a Bajan kitchen to help, I thought I’d make a start on delivering on some Bajan recipes as promised. To start we are going to do something easy. What I call Plantain Hors D’oeuvres, and if you think cocktail sausages wrapped in bacon served with a toothpick, you already know where I am going with this. 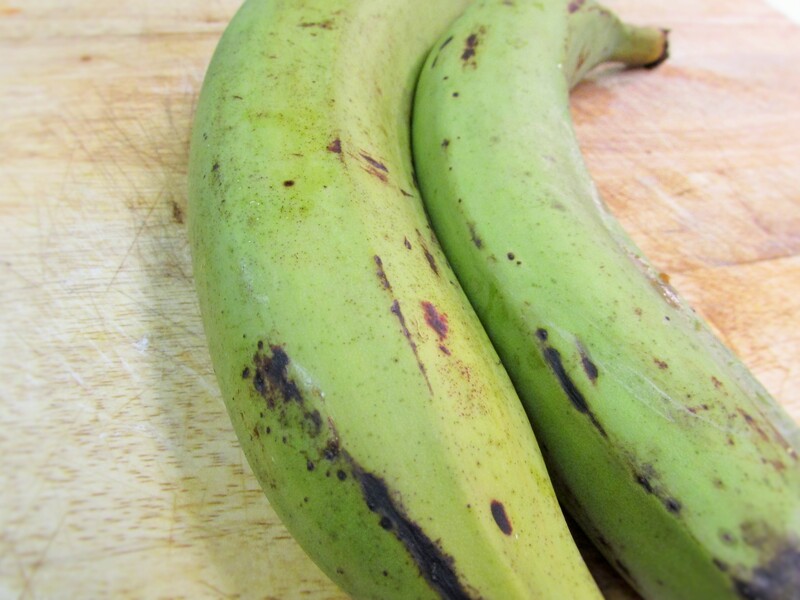 Plantain, or ‘true plantain’ is not a banana. It is not eaten raw…though I and countless others have tried. 🙂 Although it is related to the banana it has a thoroughly different texture, flavor, size and skin, and is treated more as a vegetable. It has more of the vitamins A and C than bananas and also a higher potassium level, but it has more calories too. While supposedly it has its origin in South Asia, it is common in our (Caribbean) neck of the woods and Central America as a staple because of its versatility. It can be used whether green or ripe or at any stage in-between. It is baked, grilled, fried as chips, seared, sautéed, caramelized for a handy snack, boiled, mashed, stuffed, used in soups and salads, for pancakes and pizza, or as a gluten-free/vegan accompaniment to anything else you choose! Get a couple of ripe plantains and some streaky bacon; and while the oven is warming at about 180C/350F, peel, then cut the plantain into slightly bigger than bite-size pieces. Wrap each piece in a bit of bacon and bake until brown -20/25 mins. Once finished, allow to cool, stick the toothpicks in and serve. As I am still in Canada I cannot show you a photo of ‘my latest batch’, but perhaps you can post a copy of yours. Happy eating. I meant I ‘was’ expecting to see some photographs. Where I am in Bradford does not have many Caribbean foods and I so not have full use of kitchen so…. But I challenge you: Make your own and post the result so then we would have photos. Ha! I just might do that. I would have to find something to replace the bacon though. or Duck or Turkey bacon; tofu strips sprinkled with dried chili pepper or smoked paprika; or just use thin slices of eggplant. Now go investigate and create!